Vortex - The FX Robot Battle © 1994 Pack-In-Video Company, Limited. Vortex is a polygon 3D space shooter by Argonaut Software, and is probably the least known of the Super FX games. A race of evil aliens has captured the core that holds the very peace of the universe together, and its shattered pieces have now been scattered across the universe. The goal of the game is to retrieve them all, and to save the universe. 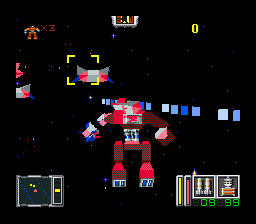 The player takes control of the Battle Morphing System, an advanced transformable vehicle. The first and default fighting mode is a humanoid Walker armed with multi-rockets, missiles and lasers. The vehicle is more suited for ground missions (such as planet surfaces), can jump in the air, collect items but is rather weak and slow in the void of space. The second mode is the Sonic Jet aircraft, which is the fastest, heavily armed but hard to maneuver (it can't stop!). Finally, the Land Burner is a strong wheeled vehicle which is very fast on land and can perform long jumps. Although a fourth form called the Hard Shell is available, it is an exclusively defensive mode with an impenetrable shield (doesn't take any damage) and equipped with only one weapon, the Electro Bomb. Vortex consists of seven levels (as well as three training missions), and features a password system to save the player's progress. Vortex was released on December 09, 1994 in Japan for 9800 Yen. Enter CTGXF as a password, then start a new game. When the parts of the core appear and rotate on the screen (right after starting the game), press up or down to select a different level.